It’s almost Valentine’s Day and this year I am prepared. Well, kind of. I’m the mom frantically walking through the open-all-night store looking for Valentine cards for my son’s class. Who knew you could buy them three weeks early. Obviously I didn’t until this year. Thank you local grocer for slapping me in the face with them last week. Boo -YA! There are Valentine’s Day cards in our house! This year I will not keep my son up until 1am writing his name on Spiderman Cards to give to his classmates. Nor will we wake up half an hour early to do them. And I will not, I repeat NOT sit in the car in the school parking lot and fill them out for him. Not this year! I don’t remember my mom ever being behind on Valentine’s Day. She was always prepared. We had our cards made out the day before. I remember talking with friends about the different cards we would get and the candy that would come with them. My mom almost always had a nice box of chocolates waiting for my brother and I when we got home. We even got Hallmark cards in our lunchbox a few years. Valentine’s Day was full of candy and card giving and the hope that the one boy in class that I liked, or that was popular, would give me a special card. (um, that never happened). What happened to the Valentine’s Day I used to know? I almost dread the overly red and pink holiday with smelly flowers and boxes of sugary mystery chocolates. I think it started in college. On Valentine’s Day if you weren’t engaged you were “dating Jesus.” Yep. I went to a Christian School. Every girl was dating the Messiah or boycotting the holiday altogether. I knew girls who would send themselves flowers or wear all black as if in mourning. I still haven’t figured out why we were so dramatic, but I think it scarred Valentine’s Day for me. Plus I stopped finding cute cards in my lunchbox and no more little crazy chocolates waiting for me when I get home. Well, my son is prepared for Valentine’s Day this year. Maybe I should get him a cute little card or box of little chocolates. This year it is my opportunity to resurrect Valentine’s Day. It can be fun I guess; red and pink chocolatey spiderman fun. 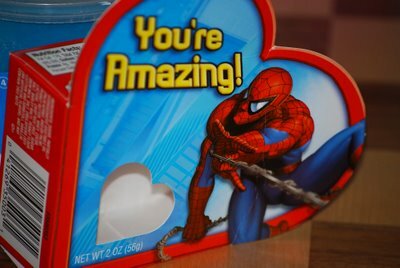 Tags: boycott, chocolates, dating Jesus, engaged, flowers, Hallmark, Kroger, ORU, Spiderman, Valentine, Valentine's Day. Bookmark the permalink.